To become a member of DC Comic's Green Lantern Corps, a being must be willful beyond imagining and fearless to a fault. Should they meet that criteria and the time be right, one of the fabled power rings may just find its way to them. In DC Universe Online, Sony Online Entertainment's super-powered massively multiplayer online role-playing game, gaining the power of the Green Lantern Corps costs $9.99. The first in a series of paid downloadable content for DC Universe Online that will take the place of traditional MMO expansion packs, Fight for the Light expands the scope of the game beyond Earth and into the far reaches of the universe, for the first time giving players the ability to wield the green light of hope or the horrific yellow of the Sinestro Corps. Does this mean you can finally become a member of the fabled corps? According to DC Universe Online creative director Jens Andersen, not quite. During a roundtable interview announcing the upcoming expansion pack for DC Universe Online, Jens Andersen explained that while players would be getting rings and hard light powers, they weren't quite becoming Green or Yellow Lanterns. "DC Comics doesn't want just anyone getting a power ring," Andersen explained, after I asked whether the iconic Lantern symbols would be available for player costumes. "In the comics, in times of great emergencies, power rings will duplicate themselves, recruiting temporary Lanterns to the cause." Folks that purchase Fight for the Light will become the recipients of those emergency rings. Heroes and villains will be able to fight alongside the Green Lantern Corps and the Sinestro Corps respectively, either by starting a new level one character or respeccing their existing level 30 characters as light wielders. "These hard light powers play very differently than the other powers in the game," Andersen told us. Players will be able to generate weapons with their rings, say a chainsaw, performing combo attacks as they would with any other melee attack in game. As they power up they'll unlock new constructs, and will be able to chain combos together. Imagine tearing into an enemy with a chainsaw, switching to a giant power drill to finish the job. Sounds like a Lantern fight to me. Andersen said the players will become reservists, worthy of wielding the rings but not worthy of the symbol. To that end the two new iconic sets of armor high level players can earn based on Sinestro and Hal Jordan's Green Lantern will feature blank white circles where the symbols should be. A recently converted Green Lantern fan, I found the news somewhat disappointing. Still, there's plenty of content coming in the pack to make Lantern faithful drool, so perhaps we can overlook this one tiny detail. It's not just about the powers, but the places as well. For such a far-reaching comic book galaxy, DC Universe Online has stuck rather close to Earth. 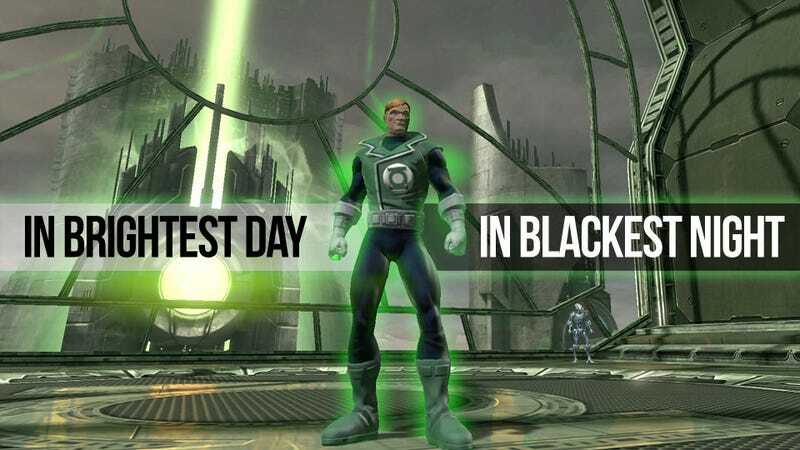 The introduction of Oa, home of the Green Lantern Corps, marks the game's first foray into the comic continuity's rich interstellar continuity. On Oa four players will team up to help either quell or stir a riot in the Sciencells, the intergalactic prison of the intergalactic police force. As you can see in image above, big, dumb, and lovable Lantern Guy Gardner will be making an appearance during the jailbreak. He'll likely hit some things. He does that. Things aren't going so well back on Earth either. Brainiac is attempting to create a pure logic battery that will cancel out all colors of the emotional spectrum, causing heroes and villains alike to flock to S.T.A.R. Labs to try and put a stop to it. In Coast City, home of Green Lantern Hal Jordan, another color of emotion has flared up: Rage. The Red Lantern Corps led by Atrocitus is tearing up the town, and Hal can't have that. Expect a very bloody time in the old city when four players team up to take the redheads down. So that makes Green, Yellow, and Red lanterns. Are the rest of DC's corps in the works? "The short answer is yes," said Andersen. "All of these guys are at our disposal to use in the future. Now that we have light powers it's very easy to expand in that direction." So fans of the Blue Lanterns, Indigo Tribe, Star Sapphires, and all of those other color groups can sit tight, secure in the knowledge that there's a strong chance your favorite characters will be making an appearance. Me? I'm a traditionalist. Expect to see me hitting bad guys with a giant glowing green fist later this summer, when Fight for the Light hits the PC and PlayStation 3 versions of DC Universe Online for $9.99.